Three fully equipped operating theatres for immediate use. The rooms are used for surgery, orthopaedics and implant surgery. 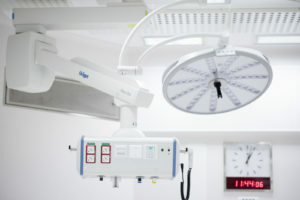 Eight modules in total; three operating theatres, three preparation rooms, one equipment room (second floor). Rented for two years by the client during the renovation of the hospital. Afterwards, the unit will be able to be disassembled and moved. Total floor space: 460 m2 across two storeys. Ground floor active floor space: 240 m2. The two largest rooms are each 50 m2. Total production time: 10 weeks of production. 5 weeks for assembly and installation. Eight modules assembled on two floors. Active areas on the ground floor and equipment areas on the second floor. Sound baffles on the walls (hygienic boards). No 90° corners, cavities between the floor and wall for cleaning. No organic materials or equipment. Lead-covered walls, hinged doors and pass-through cabinets. The ventilation is built according to the principle of dilution. 28 air intake devices / rooms with HEPA filters. Workspace lighting at 2,000 lux. Maintenance heating in the floor. 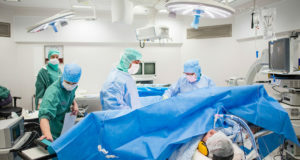 The hospital carries out approximately 3,200 operations every year. Today, there is a growing problem with bacterial resistance in healthcare settings. As a consequence, working with purity, ventilation and better work clothes at operation units has become increasingly important. 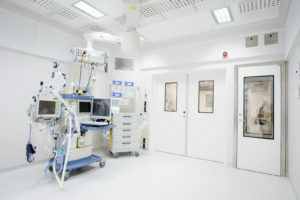 Swedish Modules’ Modular Operating Theatre concept is the result of a long-term project development that began in 2010 in collaboration with experts in the industry. 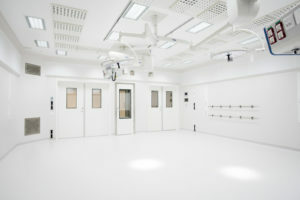 The concept is based in a research report (Nordenadler 2008) and the goal of the project was to create a better clean room environment for both the patient and provider. 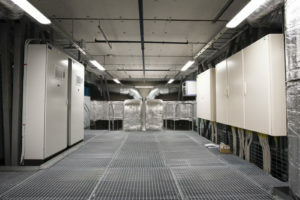 Choosing to build modularly makes it easier to ensure the clean room standard as well as offer a flexible solution with regard to the requirements and functionality of buildings: their size, placement and whether it is a temporary or permanent solution.